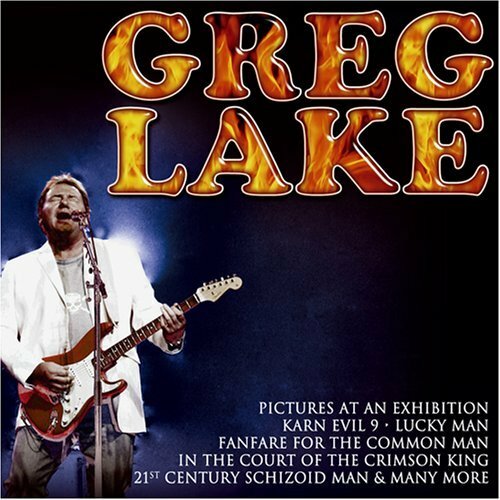 Truly out-standing live concert CD of the frontman and voice of Emerson Lake & Palmer - Greg Lake during a recent tour of his during the autumn in the UK. Show took place at the Stevenage Concert Hall on November 11, 2005. Ten tracks gives the listener(s) eight ELP songs and two King Crimson songs. Have to say this self-titled CD is way better than his 'King Biscuit Flower Hour' release that was put out awhile back. While the 'King Biscuit' show was decent and all, it's overall sound mix appeared a little weak at times. This MVD Audio title is comparable to an actual Emerson Lake & Palmer performance. Honestly, it is. Sound quality here is breath-taking. Starts off with the fantastic opener, King Crimson's ground-breaking 1969 unmatchable (even to this day) the progressive stoner rock gem - "In The Court Of The Crimson King". Next up are several tunes that seem to maybe have a bit slower pace than a few of you might expect - like "Paper Blood", "Touch And Go", "Take A Pebble" and "Farewell To Arms" but it's all still good. Great to experience once again was the powerful "Fanfare For The Common Man", one of rocks' best ballads of all time, the gorgeously played "Lucky Man", another King Crimson gem - "21st Century Man", the eighteen-minute classical ELP masterpiece - "Pictures At An Exhibition" and the hair-raising finale of this memorable event - "Karn Evil 9 (1st Impression - Part 2). Line-up: Greg Lake - guitar & vocals, Florian Opahle - guitar, Trevor Barry - bass, David Arch - keyboards and Brett Morgan - drums. All fans - casual and die hards will get many pleasurable plays from this disc. A great pick.